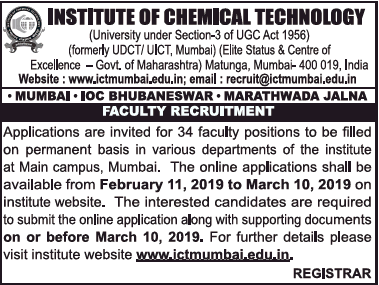 Institute of Chemical Technology, Mumbai has advertised in THE TIMES OF INDIA newspaper for the recruitment of Teaching Faculty- Professor / Associate Professor / Assistant Professor jobs vacancies. Interested and eligible job aspirants are requested to apply on or before 10th March 2019. Check out further more details below. About College: The Institute of Chemical Technology (ICT) Mumbai was established as the Department of Chemical Technology on 1st October, 1933 by the University of Mumbai, through active support of industries and philanthropists. The Institute was most popularly known as UDCT, Mumbai. Research has been an integral part of ICT since its inception and it has created over 500 first generation entrepreneurs. The UDCT grew significantly in stature and was granted autonomy under UGC regulations by the University of Mumbai and further converted in to an Institute on 26th January, 2002. How to Apply: Online application form is available on the ICT website www.ictmumbai.edu.in from 11 February, 2019 to 10th March, 2019. The Candidates are required to submit online application form along with supporting documents on or before 10th March, 2019.